Epiphytic shrub, with large swollen base, up to 1 m high. Leaves simple, spirally arranged, oblong-oblanceolate to obovate, 6-15 cm long by 2.5-6 cm wide, glabrous on both surfaces; base cuneate; apex round or slightly emarginated. Inflorescence axillary on old branches, solitary or 2-flowered fascicle. Flowers red or reddish orange; calyx 5, tube urceolate shape, glabrous; corolla 5, united into cylindrical tube, 2-2.5 cm long, 4-6 mm wide, lobes shallow, triangular shape; petiole 2-2.5 cm long. Fruit berry, globose, ca 1 cm across, glacous. Seeds flat, elliptic-ovate in outline, small. 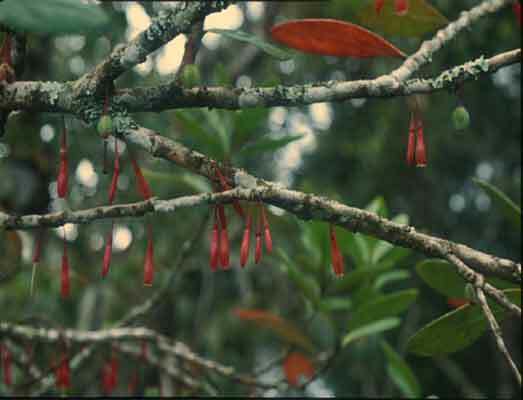 Endemic to northern Thailand, on trees in hill evergreen forests at elevations of 1,400-1,600 m. Flowering from November to February. 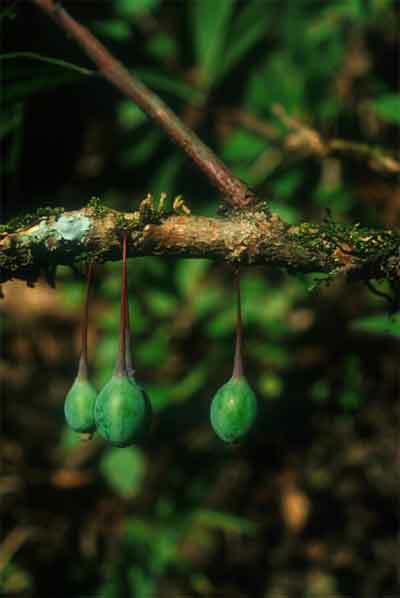 New species, in Thailand discovered by Queen Sirikit Botanic Garden’s botanist. First collected from Doi Suthep, Chiang Mai.